Rabat- Ahead of the Spain vs. Morocco match to be played on June 25, Spain’s Barcelona veteran midfielder Sergio Busquets has said that Morocco will make it difficult for the Spanish national squad to win the game and become leader of Group B.
Busquets, who was speaking to the Spanish outlet Mundo Deportivo after his country’s 1-0 win over Iran on June 20, said that the general perception in the Spanish squad is that Morocco is a serious challenger, as the Atlas Lions outperformed both Portugal and Iran despite losing to both teams by one-nil. La Roja, as the Spanish team is known, wants to top Group B to have a relatively easier match in the round of 16. But Busquets, who acknowledged the tactical depth and technical quality of the Moroccan national squad, said that the African side will pose a serious obstacle in Spain’s way to achieving Group B leadership. 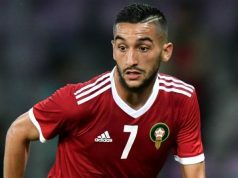 “I think Morocco played better than Iran and Portugal, but they are already eliminated,” the Spaniard declared, hinting at the possibility of a less intense Moroccan performance in their match against Spain. Although the Atlas Lions’ first two appearances at the 2018 World Cup boasted a delightful football of high pressure and possession that captivated football fans within and without Morocco, winning them the respect and admiration of many observers, their two losses against Iran and Portugal have prematurely put them out of the 2018 Russia World Cup. 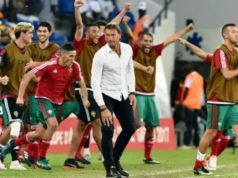 But Hervé Renard, Morocco’s French coach, said after the 1-0 defeat against Portugal that his side will try to go down in bravery and finish the World Cup with honor. With Spain dreaming of finishing at the top of Group B and Hervé Renard urging his squad to “leave the Word Cup with honor,” the Kaliningrad match on June 25 promises some high quality and beautiful football between two sides, whose playing styles at this tournament bear strong resemblance to each other.